Long morning meeting about next year’s corporate theme and strategy. It doesn’t involve a punk pig… but maybe it should. 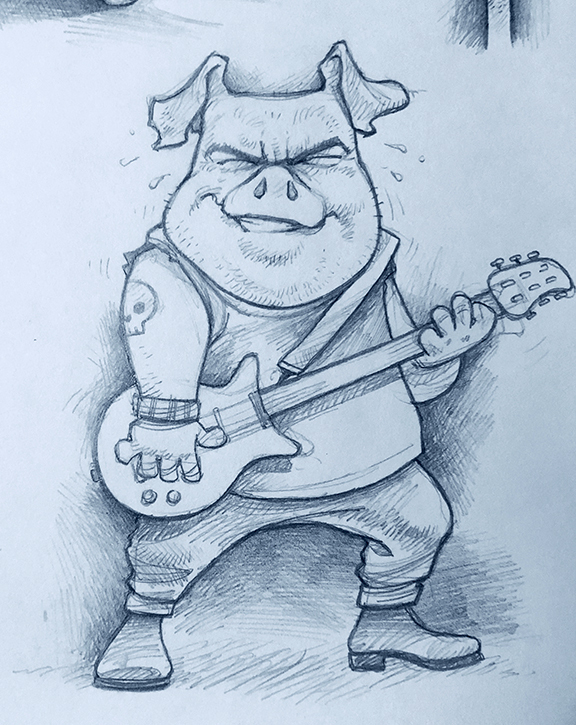 In fact, I think ALL corporate themes and strategies for next year should involve punk pigs. Major international auto makers? Punk pig. Local funeral home advertisements? That’s right. PUNK. PIG. On a whim, I thought I’d do an illustrated envelope and surprise my son by sending him a real live actual honest-to-goodness go-down-to-the-mailbox-and-get-it LETTER! And what better way to adorn it than with an angry pirate? It pretty much fills up the front of a standard envelope. The address will, of course, go on the flag. I don’t know if the post office will even send it through, but I thought I’d give it a shot. I’m looking forward to seeing what condition it’s in if and when it does arrive. I’ll keep you posted. GET IT? I’m writing a blog entry about sending a letter and I said I’d keep you posted. Man, I’m so funny I make me want to puke.